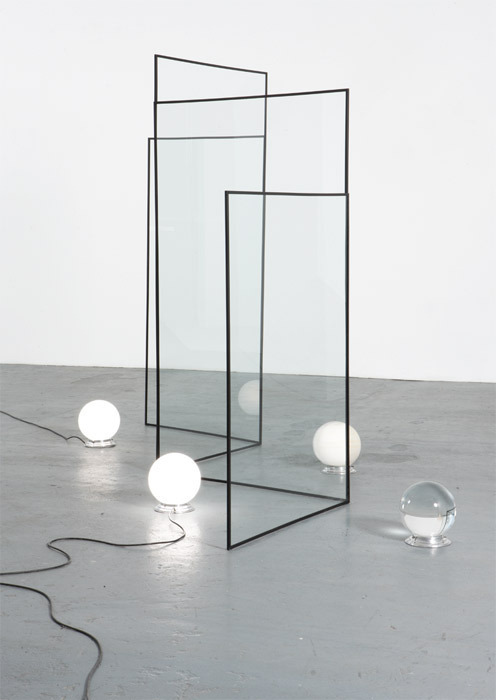 Alicja Kwade, Matter of Opinion, 2012, steel frame, crystal glass, sandstone, two Art Deco lamps, cable, lightbulb, dimensions variable. Alicja Kwade’s exhibition “The Heavy Weight of Light” had a laboratorial cleanliness appropriate to its outward focus on scientific phenomena. In a precision-tooled array of sculptural-sensorial tableaux, the Berlin-based artist tested a variety of ideas about our understanding of the innate qualities of materials and our interaction with objects in time and space. But if walking through the gallery felt at times like flipping through a physics textbook, there were enough moments of magic in the exhibition that even the less rational, more instinctual viewer would have found something worth puzzling over. In fact, “real” scientists would likely have had a tougher time with it than most, given the fact that Kwade unabashedly lets her subjectivity intrude.